ZipWall® dust barrier poles are designed for the professional contractor. Four anodized aluminum sections telescope up to 6 meters and twist to lock. Each spring-loaded pole is easy to set up without a ladder – a major safety benefit when working with high ceilings. The innovative non-skid, non-marking head locks the barrier material, allowing it to be raised with the pole, and holds it securely in place without damaging the ceiling. 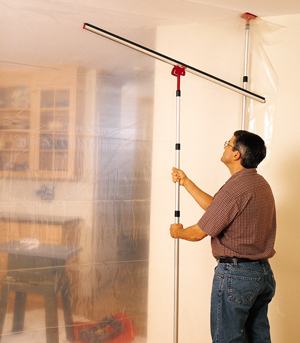 A tight dust barrier can be set up in just a few minutes, one pole at a time, without ladders, tape, or damage. Anodized aluminum construction makes them sturdier than stainless steel, smoother to raise and to lock, and the best foundation for ZipWall® accessories like FoamRail™ tapeless seals. These poles are versatile and built for heavy use. The ZipWall® 20 2-Pack is essential for jobs with high ceilings, and a great add-on to your existing set of ZipWall® dust barrier poles. Two poles can be used to create a barrier up to 3 meters wide, or close off a hallway less than 3 meters wide. 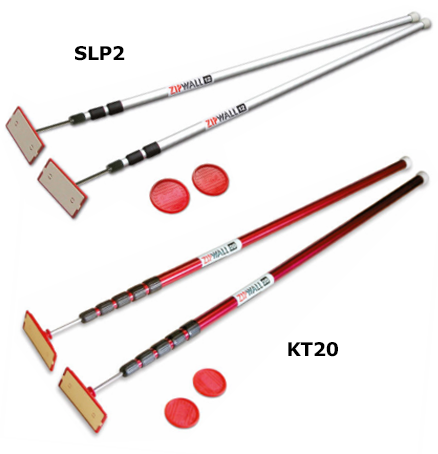 Each package contains two anodized aluminum spring-loaded poles with parts (heads, plates, and GripDisk™ non-slip pads). Plastic sheeting is not included. Two spring-loaded poles - up to 3.6 meters high. Each pole weighs just 0.9 kg. Two spring-loaded poles - up to 6 meters high. Each pole weighs just 1.5 kg. Attach to any ZipWall® pole and tightly seal a barrier along the ceiling, floor, or walls. Require no ladders or tape and leave no damage. Can be used with plastic sheeting or ZipFast™ reusable barrier panels. Two 4 foot aluminum rails with two T-Clip™ connectors per package.